In an increasingly challenging market place, the competitive edge over your rivals will most likely come from improving efficiency and effectiveness in your processes. METTLER TOLEDO draws on a global network of industry specialists and advanced inspection technologies to deliver real improvements in your product quality and productivity, which in turn supports the protection of your reputation and the welfare of your customers. In an increasingly challenging market place, the competitive edge over your rivals will most likely come from improving efficiency and effectiveness in your processes. 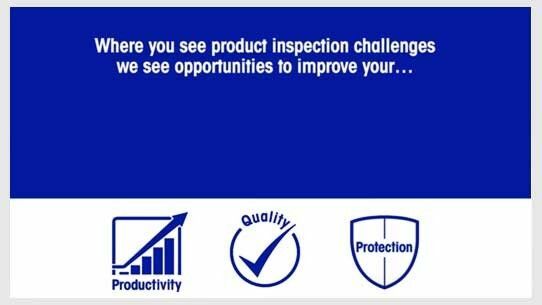 METTLER TOLEDO is an industry leader in automated product inspection solutions. We draw on a global network of industry specialists and advanced inspection technologies to deliver real improvements in your product quality and productivity, which in turn supports the protection of your reputation and the welfare of your customers. Watch our latest animation to learn more about how we can improve your productivity and quality while protecting consumers and your reputation.